The Very Intelligent Pocket purse organizer is known as something of a VIP in the handbag world - for more reasons than one! This versatile product makes life simple for everyone from pack rats to those who love changing purses every day of the week. The Very Intelligent Pocket purse organizer is just one of several "very intelligent" products that are designed to simplify life. It was created by Tintamar, a French label that specializes in functional fashion accessories with a stylish twist. The products in the lineup are dubbed "daily tools," or those items individuals don't think twice about grabbing on the way out the door. In other words, they're necessities. The difference between an everyday necessity and the Tintamar version, though, is plain. Tintamar's products appeal to a wide range of individuals from all walks of life. Students rely on them to make organization easier, while travelers are dependent on them because they offer a simplistic approach to packing for long excursions. The collection also includes bags for bikers, beachgoers and even swimmers. Don't be fooled by each bag's designation, though; just because it's deemed a "bike bag" doesn't mean you have to be a cyclist to make use of it. In fact, the entire collection is multifunctional enough to fit into nearly any lifestyle. One of Tintamar's more well-recognized and beloved products is the Very Intelligent Pocket (VIP). Though it's the intriguing and playful name that first grabs everyone's attention, it's what the product offers that really makes it so impressive. The pocket's main objective is to organize the contents of a handbag in one convenient space. Each item has its own specific area in the compartmentalized pocket, making it easy to simply grab whatever is needed at a moment's notice without having to dig through a cavernous (and undoubtedly disarrayed) handbag. Basic VIP: Just call it the one that started it all. The original VIP is plain, simple and functional, without any bells and whistles. If you're not particularly trend-driven or interested in carrying something fancy inside your bag, stick with the basic. It has nine pockets and is available in 14 fashionable colors, ranging from neutral white and beige to brilliant teal and red. Basic VIP Serie Limitee: If, however, you track the runways with an eagle eye and are always on the cusp of the latest trends, you'll want to snag a VIP Serie Limitee, instead. Each year, Tintamar designs up to two of these pockets in honor of the hottest colors, themes and styles to capture the fashion world. Like the original, it has nine pockets and is available in 14 variations, decorated in everything from pompoms and bows to floral etchings and rhinestones. Business VIP: Ideal for the busy professional, the Business VIP includes 10 pockets and is available in nine neutral, smart colors. It's specifically designed to hold larger items, such as files, day planners, paperwork and other essentials. A smaller extra pocket for storing business cards is also included. Sun VIP: Instead of just tossing all your beachside essentials in a beach bag, keep them organized in a Sun VIP pocket. This sporty version of the original includes a small, removable wallet and two interior pockets. The exterior houses four mesh pockets and one larger pocket for the always-necessary trashy novel. This pocket is available in seven colors. VIP Men: This streamlined style is essentially a more masculine version of the original Business VIP pocket. It's especially functional, with a grand total of 12 pockets to its credit, and it includes one large interior zipper compartment to keep delicate and important items safe. Using any of the VIP pockets is exceptionally simple. Just drop your essentials into the pockets of your choice and then transfer the VIP to your main bag. For example, if you're using the Sun VIP, fill it up and then insert it into your beach tote. Voila - instant organization without a moment's thought. 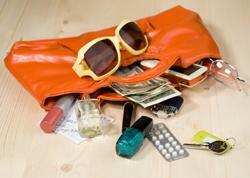 The beauty of this easy method is that you can easily change handbags on a daily basis. Just shift the VIP from one handbag to another!